It’s been a memorable day. A day of glorious autumn sunshine, striking moments – and of 3 very distinct privileges, for me at least. If you’ll bear with me, I’ll tell you about them – I think the lesson they contain is worth telling. I spent the day in Hull with my wife and her friend because I’d been asked to speak at a rally organised by Save Our NHS Hull (@saveournhshull and @nik1061 on Twitter), along with the Unison and GMB unions and other groups. Hull is facing an immediate, £99 million cut in its NHS budget – part of the massive program of £20 billion in cuts imposed on the NHS (and £50bn by 2020) by the government whose election promise was ‘The NHS is safe in our hands‘ and ‘We’ll cut the deficit, not the NHS‘. Liars all. 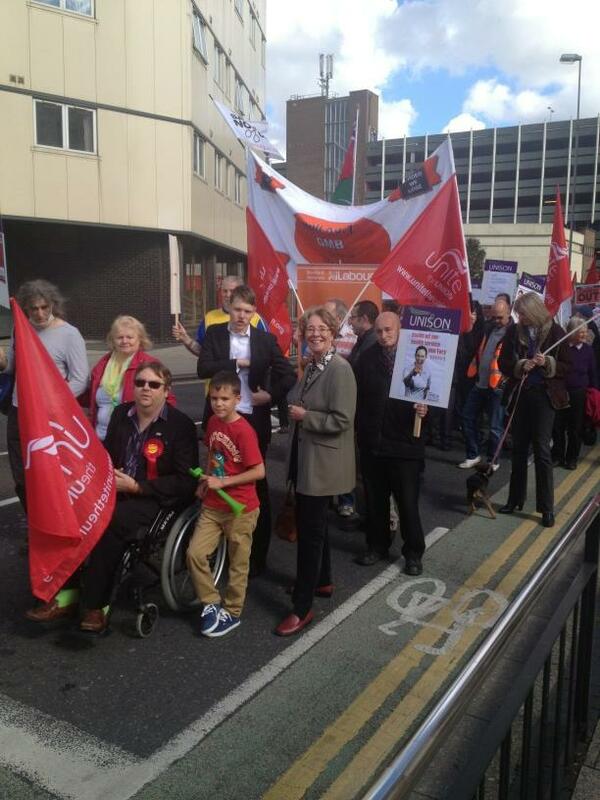 The event started off with a march of about 450 people, carrying placards and banners, around the city centre. Very orderly and very British, right down to the slightly bashful chants (except for ‘Cameron Cameron Cameron – out out out!‘ – not a trace of reticence about that one), with stewards to ensure safety and friendly police to assist. Once we returned to our starting point, the speeches began. It was a massive privilege to march with so many people who are passionate about saving our NHS, and even more so to be one of the people speaking to them. John Prescott led off with a passionate, firebrand speech about the politics of health and the government’s attack on the NHS, followed by Rev Eve Rose (@RevEveRose), who talked about her pride at working in the NHS. Then it was my turn. The placard I’d carried during the march had made an impact on me, and I ended up ignoring all my notes and talking around that. It said ‘The Silence is Deafening: NHS staff gagged’. I spoke about the deafening silence in the media on the destruction of our NHS; about the fact that the news media can find ample time to cover the issue of Kate Middleton’s breasts but none for coverage of what’s happening to our NHS under the Tories’ Act; of Freedom of Information requests, the lengths to which some Trusts have gone to avoid answering them; the fact that those FOI requests have revealed the government’s involvement in the formation of the South-West NHS pay cartel, its intention to use that regional attack on NHS staff as a national pilot project and how that means we all have to fight for each other; about the BBC’s risible responses to complaints regarding its non-coverage of such a key issue; about the Tories’ desire to dismantle not just the NHS but the whole welfare state. Above all, I spoke about how the government’s determination to keep its treatment of the NHS ‘under the radar’ demonstrates the Tories’ terror of an informed electorate – that if people understand what they’re doing, they’re dead in the water – and of how critical that makes the task of raising awareness. We have to be prepared to make ourselves a nuisance to friends, family, colleagues, to anyone who’ll listen, in hammering home the message of what’s being done by this unelected, venal rabble. When the event wound down, I went with my wife and her friend to look for something to eat. My wife decided en route that she needed to go into House of Fraser to look for a birthday present for someone. She and her friend went in, and I sat at a table outside the shop to mull over what I’d seen and heard at the rally – and felt, I admit, a sense of frustration at the conversations of people going past as they talked about the X-Factor, or TOWIE, or their latest purchase. The scale of the task of opening people’s eyes to what’s going on felt very big at that point. But little though I realised it, I was about to stumble into the 2nd privilege of the day. As such things do, this one came in an unexpected form. An obviously homeless man walked past with his threadbare dog. I happened to look up, and the man paused and looked me in the eye. He was in a really rough way – whether the worse for drugs or drink or else suffering the long-term effects of them, I don’t know. He could barely articulate his words, but I understood that he was asking whether I could help him. I’m no saint. When I meet the homeless. I desperately want to help but at the same time I suffer a cascade of mixed emotions – above all a sense of complete inadequacy to really meet the need, mixed with a desire to treat a human being as a human being and a quiet shudder at the dirt and smells that go with being in that situation. Thank God, the human being in me won, and I beckoned the man over and asked him what he needed. He came over and immediately burst into tears. All I could make out was ‘I’m sorry, I’m sorry’, over and over. I told him he didn’t need to apologise to me – Lord how I meant it – and asked his name, which he gave me. I told him mine, and he grabbed my hand to shake it. His arms were covered in old, criss-cross scars from previous self-harm, and his hands were torn and scabbed. I couldn’t understand much that he said, but I wanted to show him somehow that I was interested in him, so I asked him to tell about himself. I could make out ‘I can’t explain’ before he burst into tears again, grabbed both my hands in his and just held them as he cried – and apologised over and over again, clearly mortified at the thought that he must be embarrassing and bothering me. I don’t think I’m being melodramatic to say that it was a holy time. The thing was, nothing I could offer was adequate to the need – and yet, in that moment, it was somehow enough. I wasn’t doing the man a favour – he was granting me a privilege of stepping out of the little bubble of self-interest that we usually inhabit, to meet someone at their point of absolute need. Sitting there, holding hands with a complete stranger crying on me, I probably looked odd to anyone passing by – and yet it was one of the most memorable privileges of my life. When he eventually went on his way, I was blinking back tears and feeling… awestruck. My wife’s friend came out and I asked her to watch my things while I went to wash my hands – being moved doesn’t mean we can’t be practical – met up with my wife when I went into the shop, and we moved on. A hundred yards or so down the road, we came across a little knot of people gathered around a bench. I looked more closely and saw that the homeless man was at the centre, with his dog. A girl told me that another dog had just grabbed his by the throat and savaged it. The dog was sitting there and I could see plenty of blood, and the homeless man was naturally very upset. But in the midst of all that trauma was something beautiful. One well-dressed lady was holding her scarf to the dog’s throat to stem the bleeding (the dog didn’t, fortunately, seem in too much distress). Another was holding the homeless man’s hand, patting it reassuringly. A 3rd stranger had his arm around him, asking whether he was alright. It was at that moment that I realised that all three of my privileges of the day were connected. The reason that this government is such a disaster for the NHS and for the country as a whole is also the reason that they are impoverished and morally destitute. Cameron and co see people in terms of resources – the rich have them, the poor are a drain on them, and the Tories can’t see anything but that. They don’t have the heart or the wit to see what they’re missing. If the Tories had that wit and heart, they would see that the NHS (and our welfare state in general) is far, far more than a question of mere facts and figures – and that politicians entrusted with it are being granted a massive, massive privilege: that of being there for people at their time of greatest need and deepest vulnerability. Of course, the NHS isn’t perfect. Nothing ever is – and the scale and depth of the need is so great that nothing could ever be adequate, let alone perfect. And yet, just being there, being willing and ready to do what we can to meet the need, to recognise someone’s humanity and vulnerability and to do what we can, is enough. I despise everything that Cameron and co stand for politically – but I feel a sense of pity for them in their blind, limited, self-obsessed little world. They have so little idea even of what they’re missing. But that’s not true of most people. The little knot of concerned and practically compassionate people gathered around the man and his wounded dog demonstrated something wonderful and uplifting: if people see the need, the vast majority will rise in natural compassion to meet it. And that brings us full circle, back to the rally. I told the protestors and onlookers that the Tories are terrified of an informed electorate – that if people see what’s being done, the Tories will be routed at the next election, and if Labour then does its job properly, the Tories will be out of power for a generation or more. That’s why they’re working so desperately hard to prevent people from becoming aware of what they’re really doing – blackmailing and corrupting the BBC and using every ounce of influence their allies in the press can muster. It’s why it’s so essential that every concerned person works as hard and harder to spread the word – and why we should thank God that we live in the age of social media, so that the press, TV and radio are not the only way we can get our information. The task may look huge, but we should be full of hope and optimism. Today’s scene in the street after the dog attack showed that if we can make people aware, they’ll respond with outrage at what the coalition has done and continues to do, and with natural compassion toward the targets of the attacks, abuse and propaganda. The task is huge – but we’re not trying to reach the hard-hearted. We’re trying to make a people that is mostly kind, decent and compassionate aware of a government that isn’t. Jump in, and let’s get it done together. If we all work together, we can do it. Thank you for this eloquent and moving piece. It expressed the situation so accurately, I was deeply moved. Well said, and spreading the word 🙂 If I may suggest looking into live web streaming, there are free accounts that will allow you to broadcast from a mobile phone camera straight onto the internet .. Thank you for a very moving story. Unfortunately most Tory voters are set in their ways and believe they are improving a socialist NHS by privatisation. Some are blinded by self interest. You and I know they are wrong. I believe that part of your Labour Party and part of my Liberal Democrat Party think alike on social issues. I agree there is much at stake and perhaps our two parties should get together in England in 2015 to defeat the Tories in much the same way as happened by the will of the voters in Scotland in 1997 to oust them such that there is only ONE Tory MP in Scotland today. Ah, you meant this one I guess? I’m open to anything that will consign the Tories to a very deep hole for a very long time. I’ve no problem with LibDem grass roots supporters but I confess I’d find it hard to make an agreement with most of their current Parliamentary leadership! Needs must, I guess, but I hope we can win an outright majority and make some radical change! Dear Steve, ����I know you are busy. You have a reply to your 22 Sept. Keep going. Hi Steve, Sorry, I missed sending a post . Up to date now.